Spooky Symphony was Super Fun! My family recently had the pleasure of attending the Spooky Symphony, one of the productions of the Plano Symphony Orchestra’s (PSO) Family Symphony Series. This performance featured all the instrument families–Strings, Percussion, Woodwinds and Brass–a special treat, particularly since this was my children’s first time to attend a symphony concert. As the name suggests, the Spooky Symphony was a Halloween themed concert so when we arrived at the Eisemann Center, the venue for the concert, we saw most of the children dressed in costumes and a few adults too. 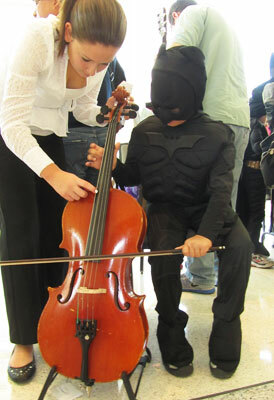 PSO had decorated the main atrium festively in addition to providing the pre-show children’s activities they set up prior to each of their family concerts. 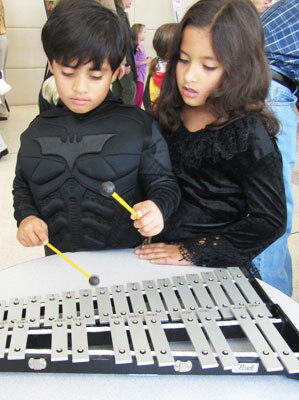 An instrument “petting zoo” was available so that children could pick up and explore various instruments such as a violin, a cello, a trumpet, drums, a saxophone, a xylophone, etc. Both my children enjoyed playing with the instruments and my son had fun pretending to be a conductor at the conductor’s station. My daughter also took advantage of the coloring station that was set up. The pre-show session was quite fun for the kiddos! Since this was the twins’ first symphony, I explained to them that instead of watching a show, they would be listening to the show. I wondered how they would react and whether they would sit still throughout the performance. As it turns out, I had nothing to worry about! The conductor and orchestra did a fantastic job interacting with the audience and keeping little ones engaged with humorous skits throughout the hour-long concert. The musical performances by the Plano Symphony Orchestra were outstanding! The twins and my husband really enjoyed the theme song from Star Wars and I very much liked the theme song from Superman. One of our favorite parts of the show was when the conductor told a fairy tale, weaving music into the story to illustrate actions within the story. That was a lot of fun! The Spooky Symphony must have made an impact on my two eight-year-olds. They had an opportunity to go back to the Eisemann Center a couple of days ago to see a special symphony presentation for a school field trip and couldn’t contain their excitement! I’m so glad that my children had such a positive experience attending the Spooky Symphony. I would definitely take them to see a Plano Symphony Orchestra performance again! The PSO’s Family Symphony Series is a great way to spend an afternoon with your family and with tickets costing as little as $7.00 a piece, it’s a great and inexpensive way to encourage your children to embrace the arts! Visit the Family Symphony Series page to purchase your tickets. For general information about the Plano Symphony Orchestra, visit their website at http://www.planosymphony.org/. Mina Frannea is an online media professional, and she is the editor and social media manager at North Texas Kids Magazine. A self-proclaimed geek, Mina also enjoys the Arts, new technology, cooking, enlightening discussions and sharing relevant information on her blog TheMomsJournal.